So if you forget Windows 7 guest or user password then you can reset it by using the administrator account. But what if you’re the only administrator account got locked and unable to login? 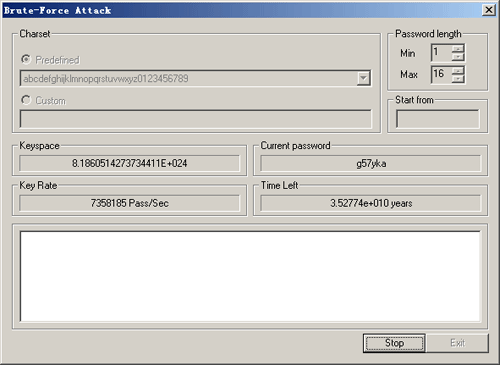 As long as you have a PCUnlocker boot media, you can use it to bypass Windows 7 password easily. 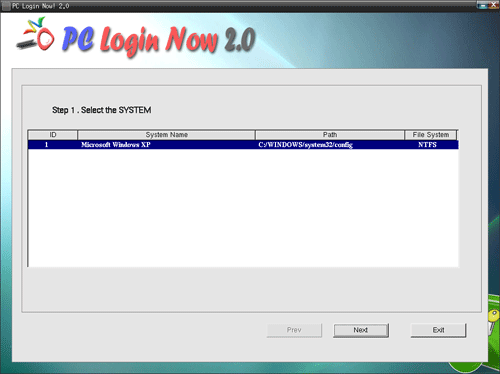 This tutorial will walk through the steps to bypass Windows 7 login password from scratch. 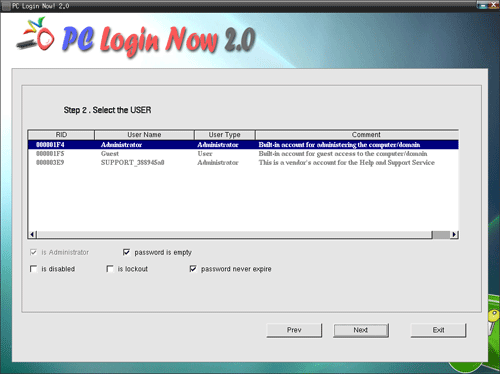 How to Bypass Windows 7 Login Password from Scratch? 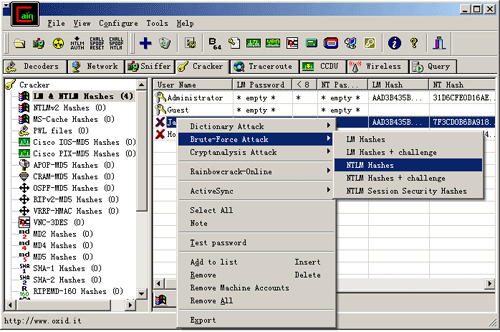 Before we can do anything, we need to make a PCUnlocker Live CD (or USB drive) using a computer with internet connection. Download the self-extracting archive of PCUnlocker which contains a bootable ISO image. Burn the ISO file to a CD or USB drive with ISO2Disc, ImgBurn, Rufus or other similar burning programs. Insert PCUnlocker Live CD into your optical drive and then restart your locked computer. If you have either on a USB flash drive, that will work too. As your computer boots there should be a splash screen, and in some corner of a screen, there is usually a message that will flash telling you which key is used to enter “Setup” or something similar. 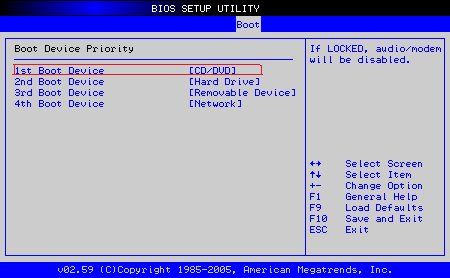 Once in BIOS Setup, look for a section labeled “Boot Priority” or “Boot Order” and follow the on-screen instructions for changing it such that CD/DVD-ROM is a higher priority than the hard drive. After changing the boot order, you should now be able to boot into the PCUnlocker Live CD that we’ve just created. When presented with the PCUnlocker screen, select your desired user account and click on “Reset Password” button. This will reset lost Windows 7 login password as well as unlocking your disabled or locked-out account. Remove the PCUnlocker Live CD and then restart your computer. This time your computer will boot up from the local hard drive and it allows you to login to Windows 7 without a password! When you install or upgrade to Windows 8.1, you’ll be forced to create a Microsoft account or use an existing Windows Live account to log on your computer. There is no option to setup a local account during the installation. 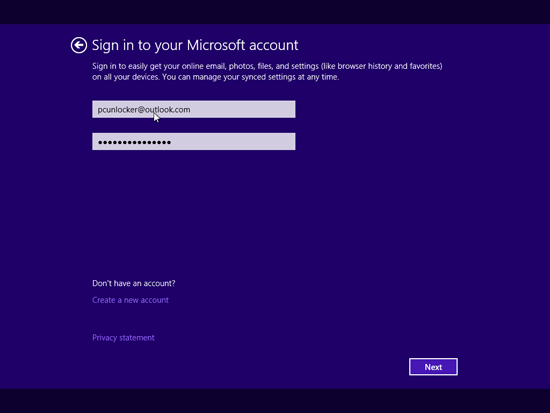 Microsoft account is now the preferred sign-in type since Windows 8. However, if you insist on using a local account, you’ve come into the right place. In this tutorial we’ll walk you through the steps to setup / install Windows 8.1 without a Microsoft account. Tips: If you forgot your local or Microsoft account and can’t sign into Windows 8, you can bypass the password with PCUnlocker and regain access to your computer. How to Setup Windows 8.1 without Microsoft Account? Boot your computer from Windows 8.1 installation DVD or USB drive, and follow the setup wizard until you see the screen where asks for your Microsoft account to continue. 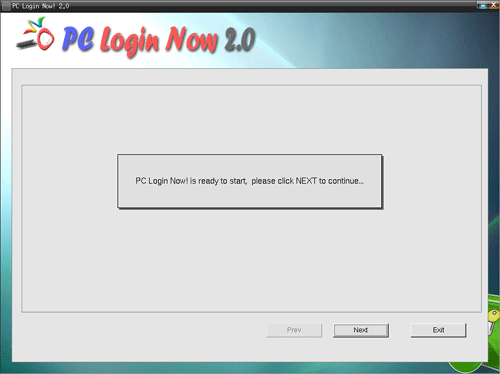 Enter an invalid Windows Live account or an incorrect password like shown in the following screenshot. Click on Next. You’ll get some information that indicates your email/password is not correct. 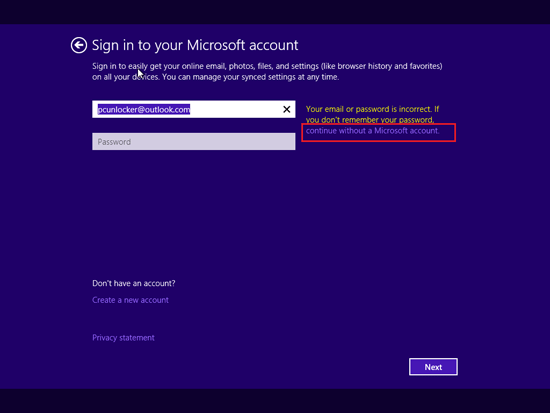 Simply click on the lightly-colored link that said “continue without a Microsoft Account”. Now we need to press “Create a local account” button. Type your local account name and password and click on “Finish”. Proceed to complete the left task of your installation. 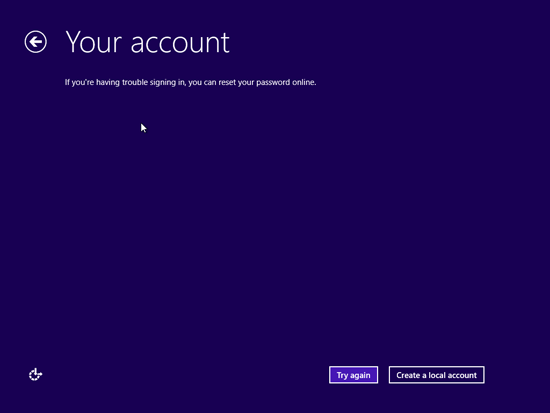 I am locked out of my Windows 8.1 laptop and cannot unlock my Microsoft account. How can I get back into my laptop? Locked out of your Windows 8.1 computer and can’t remember the password of your local or Microsoft account? Windows 8.1 encourages users to log in with Microsoft Account for enjoying the benefits that cloud brings. 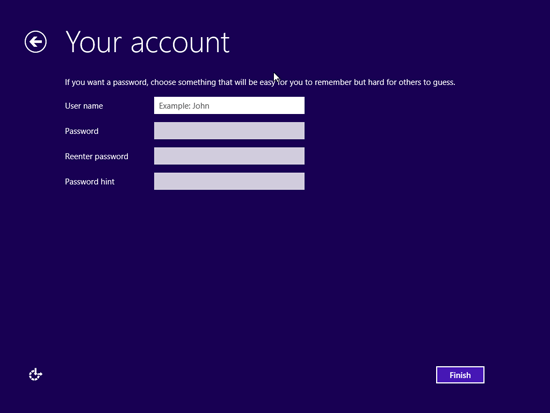 However, if you forgot the Microsoft account password, things can get more tricky than using a local account. In this tutorial we’ll show you how to unlock Windows 8.1 computers with a boot CD, no matter you’re using a Microsoft account or local account. How to Unlock Windows 8.1 Computers? First of all, you have to download the ISO image of PCUnlocker using an alternate computer you can access. Once the download is complete, unzip the download file and you’ll get the bootable ISO image: pcunlocker.iso. Burn it to a blank CD (or USB drive) using the freeware ISO2Disc or ImgBurn. Now turn on your Windows 8.1 computer that you’re trying to unlock. Insert the burned CD and set the boot sequence to CD first in the computer BIOS. Once your computer boots from the CD, it begins to load the Windows PE system. After the booting procedure is complete, you’ll see the PCUnlocker program which displays a list of local accounts found in your Windows SAM database. Choose a local account and then click on “Reset Password” button. Confirm your operation and the program will reset/unlock your password quickly. If you need to unlock a Microsoft account, choose the local account that’s been linked to your Microsoft account, and click on “Reset Password” button. The program will update the cached logon credentials so you can later sign into your Windows 8.1 Microsoft account with a new password. The last step is to restart the computer and remove the PCUnlocker Live CD. You can then log back into your computer with a new password! If you’re using PCUnlocker Std or Pro editions, you may need to disable UEFI to run the Live CD. If you’re unfamiliar with UEFI BIOS, I suggest you to use PCUnlocker Enterprise, which can boot in both UEFI and Legacy BIOS mode. 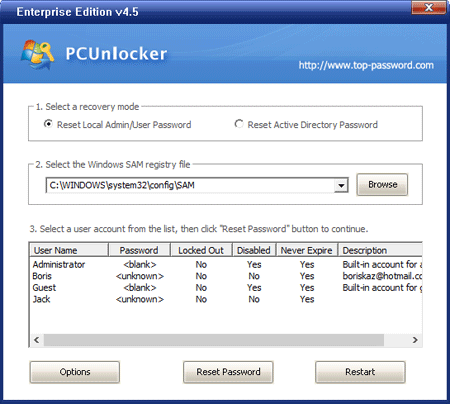 PCUnlocker can also be used to reset lost Windows 8, 7, Vista and XP passwords.